A learned and fluent, delightfully overstuffed stroll through the Gates of Eden. “It was all because of Darwin,” writes Kass (Committee on Social Thought/Univ. of Chicago), that he came to study the biblical book of Genesis, in which the earth is created, populated, depopulated, and scourged in various awful ways. Blending science with philosophy, anthropology, linguistics, and other disciplines—but with only a smattering of theology as such—Kass turns to some of the big questions that science cannot or does not care to answer, as well as to a few ticklish other matters: “How, we wonder, does the speaker know what he is talking about? Why should we believe him? . . . On the basis of what other than prejudice—prejudgment—can we decide whether the text is speaking truly?” Kass provides no firm answers (how could he? ), but he grapples nobly with the notoriously difficult text from first words (“In beginning,” he translates, eschewing the definite article, “God [’elohim] created the heavens and the earth”) to last (“the very last word of Genesis is ‘in Egypt’ [bemitsrayim]”), commenting, elucidating, and arguing along the way. Kass, now chairman of the President’s Bioethics Committee, is inclined to a generous view of human and divine nature, though his Garden—a place that appeals to “beings with an uncomplicated, innocent attachment to their own survival and ease”—conceals plenty of Darwinian thorns. On the matter of Cain and Abel, for example, he ventures, “readers recoil from considering the possibility that enmity—yes, enmity to the point of fratricide—might be the natural condition of brothers,” while among the other matters Jacob must wrestle with, Kass has it, is “nature’s indifference to human merit.” But all those big questions and problems, Kass concludes, resolve into an overarching one, the real subject of Genesis: “Is it possible to find, institute, and preserve a way of life that accords with man’s true standing in the world and that serves to perfect his godlike abilities?” Hmmm. Mix Harold Bloom with Stephen Jay Gould, and you’ll get something like Kass. 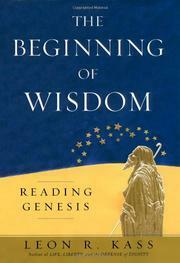 A wonderfully intelligent reading of Genesis—and surely worthy of sequels, a fat volume for each branch of the Pentateuch.